Federal Reserve Vice Chairman Stanley Fischer said both monetary and fiscal policy steps may be needed to fend off a protracted period of sub-par economic growth. “Ultra-low interest rates are not necessarily here to stay, especially if the right policies are put in place to address at least some of their root causes,” Fischer said in the text of a speech he is scheduled to deliver Wednesday in New York. Without citing specifics, Fischer called for “transparent and sound monetary policies here and abroad,” as well as investments in infrastructure and education, along with more effective regulation to boost productivity and longer-run potential growth. Fischer didn’t comment directly on the near-term outlook for the U.S. economy or monetary policy in the text of his remarks to a central banking seminar organized by the New York Fed. U.S. central bankers left rates unchanged when they met Sept. 20-21 in Washington. In more than seven years since the Great Recession, Fed officials have raised interest rates only once, in December 2015, amid persistently low inflation and slow economic activity around the world. Economists in and outside the Fed have increasingly blamed the sluggishness on longer-run trends beyond the control of central banks. Fischer said chronically low rates could, in part, stem from a decline in the so-called natural rate — the level at which rates neither boost nor slow the economy. “A very low natural rate of interest is worrisome because it may reflect more deep-seated economic problems,” he said. Low potential economic growth, Fischer said, might be a result of a slowed pace of technological innovation that has led to a lower rate of investment and higher savings. Twitter Inc. fell as much as 11 percent in extended trading following a report that Alphabet Inc.’s Google isn’t interested in buying the social-networking service. Technology news website Recode reported Wednesday that Google doesn’t currently plan to make a bid for Twitter, citing unidentified people familiar with the situation. Disney and Apple are also unlikely to be suitors, Recode said, without naming its sources. 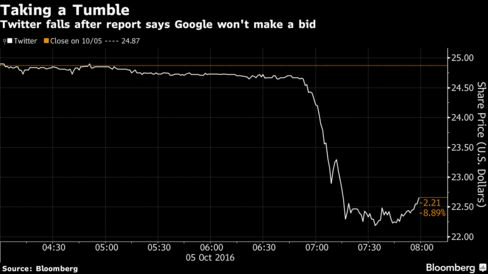 A representative for Google declined to comment on the report, while Disney didn’t respond to requests for comment. Apple declined to comment last week on reports that it was interested. Google tapped Lazard Ltd. to explore making an offer for Twitter last month, people familiar with the matter said at the time. The search giant has looked at acquiring San Francisco-based Twitter in prior years and passed. Salesforce.com Inc. and Walt Disney Co. have also retained bankers to consider Twitter bids, which could come in the next couple of weeks. Twitter shares, which jumped 5.7 percent to $24.87 at the close in New York on renewed speculation about a takeover, slid as low as $22.10 in late trading. Despite the fact that creating a budget is fairly straightforward, more than two-thirds of Americans do not have one, according to Gallup. The scary part: By neglecting to create and follow one, they may be putting their families at risk. “The difference between people who are financially secure and those who aren’t is often times one thing — a budget” Indeed, a budget can help you pay down your debt; save for retirement, emergencies and other things; and pay for the things you want and need. Here’s a simple, step-by-step guide, to creating a budget. 1. Make goals. Whether it’s driving or budgeting, it’s hard to get somewhere without knowing where it is you want to be. That’s why it’s essential to write out, and prioritize, your financial goals. Then, think about other things you’d like to get out of life that cost money — taking a vacation, renovating your home, whatever — and add those to the list in order of the importance they have in your life. If you have a spouse or partner, it’s important to include him or her in this discussion, as well as in the budgeting process. 2. Figure out your monthly expenses. There are two ways to do this (or use a combination of the two), both with the goal of determining everything you spend money on and how much you spend on it in the average month. First, you can gather all your financial statements from the past few months; these include bills, credit card and debit card statements; checking and loan account statements receipts and anything else showing the expenses of your household. From there, add up your total expenses for the past few months to determine your typical monthly spending. For some of you, this will be difficult. Maybe you pay cash for a lot of things and don’t keep receipts or maybe you toss bills. In that case, track your spending for a few months by writing it all down in a notebook or by putting it on your smartphone. Every single dollar that leaves your pocket must be accounted for. Once again, add up your total monthly expenses using this information. You should also make a note of any large expenses that aren’t monthly — homeowners or car insurance payments or an annual holiday you take — as these will need to be accounted for. Many experts recommend breaking these costs out into smaller monthly costs so you can easily account for them in your monthly budget going forward. For example, if you have bigger expenses such as tax payments that you need to make annually or every quarter, just divide the annual amount by 12 and add that to your monthly expenses. Then you won’t be caught out when the due date comes around. Essentials: These are expenses you have to pay, including housing, food, transportation, utilities, debt and tax obligations. Nonessentials: These are things that you can spend your discretionary income on, such as vacations, eating out, entertainment, enrichment. 3. Determine your net monthly income. To figure out how much you money you take home each month, gather all your pay stubs, interest statements, child support payments and any other information that shows income earned. From those, you’ll want to calculate what’s called your net income, which is the amount your household actually brings home after all deductions have been taken from your paychecks. These deductions may include taxes, Social Security payments, health insurance premiums, deductions for retirement savings, union dues, life insurance premiums, even wage garnishments and liens. If your expenses are higher than your income, you risk going into debt further, so look to cut costs from your list of nonessential expenses in Step 2. Could you stop going out to dinner, push your vacation until a later year when you have more money, stop getting a latte each morning? Some experts recommend trying to break one of your expensive habits each week (if you try to do too many at once, you might fail) until your spending is under control. Once you are at a point where you can pay for all of your essentials (debt payments, housing, transportation, health-care costs, etc. ), you’ll want to begin paying for the goals you listed in with saving for retirement and an emergency fund at the top of your list. If you’re not sure what these goals will cost you each month, use an online calculator (Bankrate.com has several) to figure that out so you can make room for those costs in your budget. If you have extra money coming in each month after meeting your expenses, look to bolster your savings and begin funding your secondary goals. 5. Simplify your financial life As much as you can, automate your bill pay for everything from your mortgage to your utilities (so you don’t miss payments and get hit with late fees) and savings (so you aren’t tempted to spend the money sitting in your account). Added bonus: Some lenders and utility companies even offer reduced interest rates (or other benefit) for use of their automated payment services. 6. Stay on track To ensure you have enough money each month to meet all of your expenses, pay down your debts and save for your goals, you should continue to track your spending every month. Note everything you spend money on each month (don’t forget to add in those bills you have automated) by either writing down your expenses on a sheet or paper you carry with you or in your smartphone notes works too. (If that’s a bit too labor-intensive for you, you can review your bank and credit card statements each week to track spending and insert each item into your budget then.) It’s very similar to writing down everything you eat when trying to lose weight. Review your spending at least weekly to ensure you’re on track. If you find that you’re still spending too much despite writing down all your spending, start cash — yep, cold hard currency — for everything that you can. Each week, take out the amount of cash you’re allowing yourself to spend and keep the credit cards and debit cards hidden from yourself. 7. Be adaptable. Changes to both your income and spending will happen, and you may need to restart this process if the changes are significant. Even if they’re not, you may still need to adjust your budget each month to reflect true spending. You may get hit with an unexpected expense, for example, that zaps your emergency fund, so you have to put that goal ahead of say, saying for a trip. Or you may find that your expenses are ticking up, in which case you will need to work on ways to cut costs. What’s the Best Way to Exchange Money While Traveling? Tips on avoiding a bad exchange rate and high fees. With lower airfares and a stronger U.S. dollar, many Americans are traveling abroad. But once they get there, they need to be wary of exchanging money. It’s easy to get ripped off. The first rule of thumb is to avoid foreign exchange kiosks and storefronts, says Matt Schulz, senior industry analyst at CreditCards.com. “The rate you are going to get simply isn’t what you can get through a credit card,” Schulz notes. Or even a debit card, for that matter. Travelex, the currency exchange company that operates kiosks in airports around the world was offering an exchange rate of 1 euro for $1.26 in early October. On the same day, MasterCard’s exchange rate was 1 euro for $1.12, Schulz says. That may not sound like much, but it can add up. If you’re paying 500 euros for train tickets for your family and charge it to your MasterCard, it would come to $560. But if you exchange your dollars for 500 euros in cash at the Travelex counter, you’d end up paying $620, Schulz notes. Schulz recommends travelers rely on two basic tools: a credit card that does not charge foreign transaction fees, and a bank debit card, which typically offers competitive exchange rates. Here are some basic rules to help you get the best currency conversion rates while traveling outside the U.S.
Use your debit card if you need cash. You can use your debit card to make a withdrawal at a local bank ATM. It’s a good idea to research what your bank charges for foreign ATM withdrawals, however. Some tack on ATM fees of $3 to $5, as well as a debit transaction fee of up to 3 percent. If that’s unpalatable, consider opening an account at a bank that doesn’t charge such fees, such as Simple. Charge purchases to a credit card that doesn’t charge foreign-transaction fees. Such a card can save you from paying fees that are as much as 3% of what you charge. There are many such credit cards available, such as the Capital One Quicksilver Cash Rewards card or the Chase Sapphire Preferred card, so research which rewards program would make the most sense for your spending habits. If you need to apply for such a card, be sure to do so at least six to eight weeks before your trip to ensure the card arrives on time. Avoid currency kiosks. They rarely provide favorable rates when you exchange money. To see how much they vary, check rates at Travelex and MasterCard. Don’t let foreign merchants charge you in U.S. dollars. This is one trap that credit card users sometimes fall into, Schulz says. If a merchant offers to charge your card in U.S. dollars rather than the local currency—also called dynamic currency conversion—don’t agree to the offer. The exchange rate is often poor, and the merchant may also add fees on top of that. It’s best to leave your charge in the original currency and let your credit card company provide you with its exchange rate. Don’t use your credit card for a cash advance. Credit card companies may offer competitive exchange rates, but many charge high fees and interest rates. On top of that, the interest on a cash advance begins immediately when you take the money, instead of after the typical interest-free grace period for credit card charges.